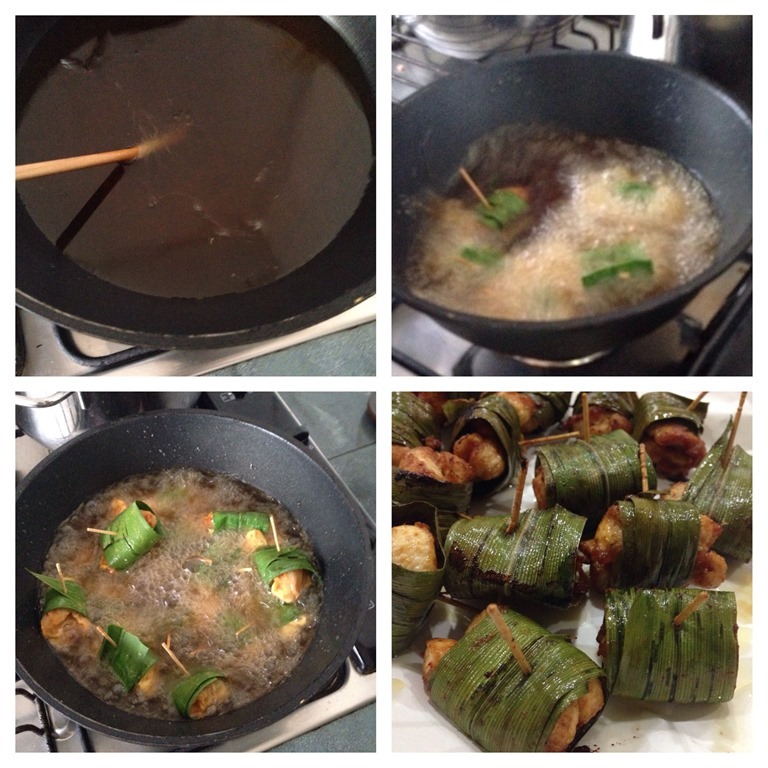 I am preparing this for dinner and I am sharing another type of wrapping without the need to use a toothpick. Please scroll down towards the end for an updated procedure. 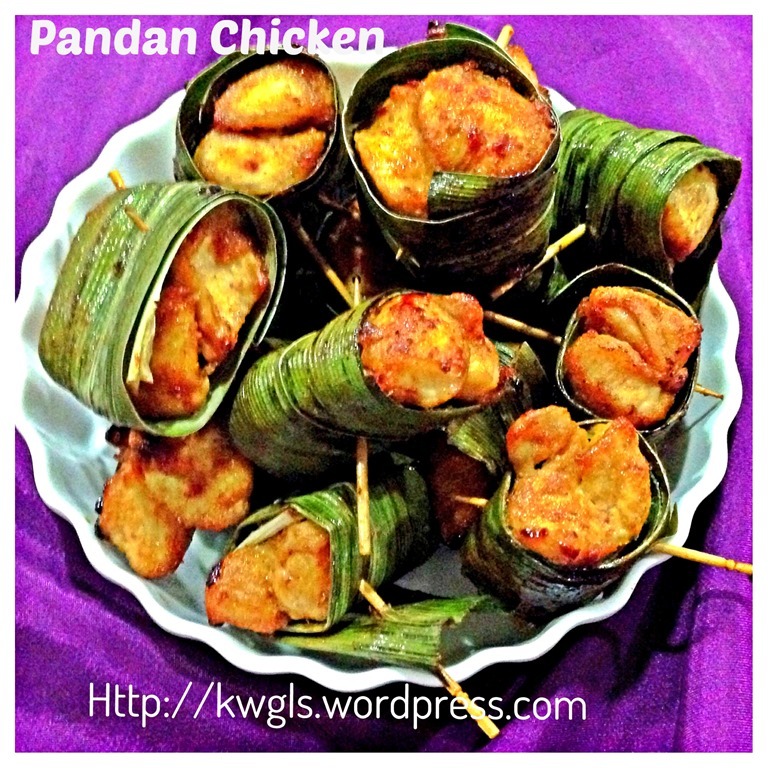 I have Pandan Chicken many years ago when I was back in Sarawak. 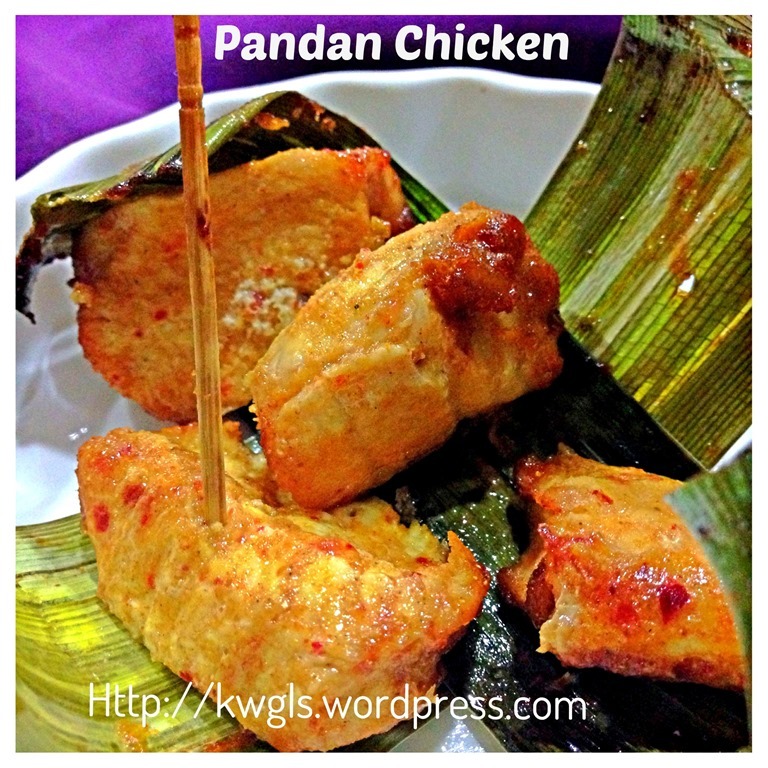 I remember my mom learned this dish from my cousins and was not a common dish that she had prepared. 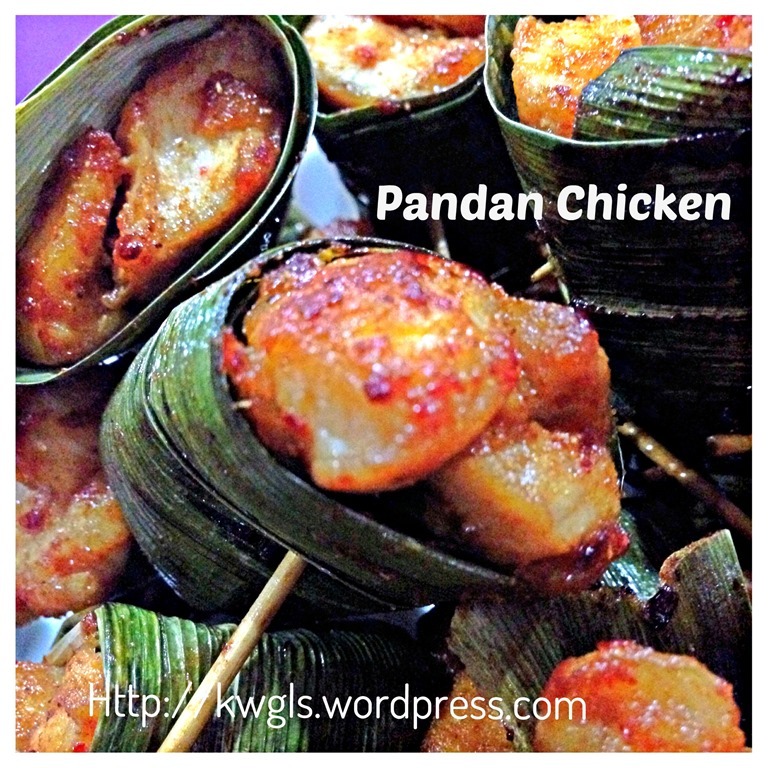 When I studied in Kuala Lumpur and I travelled overseas, on and off I have chances of having this dish in restaurant especially in Thai restaurants. However, I can’t really recall the unique taste of this chicken dish. What I can recall is the subtle Pandan aroma and is wrapped in screw-pine or Pandan Leaves. 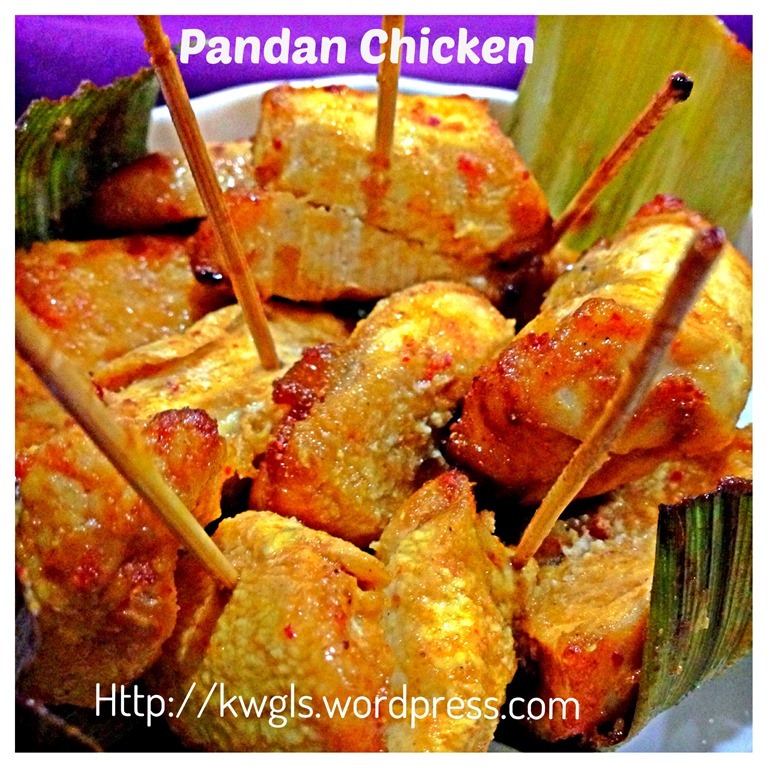 When I searched for recipes of this dish, I was shocked to find that the marinating agents can vary significantly among recipes. Some have used very Chinese style flavouring like oyster sauce, sesame oil while some others, which includes fish sauce,Thai pepper powder and etc.. 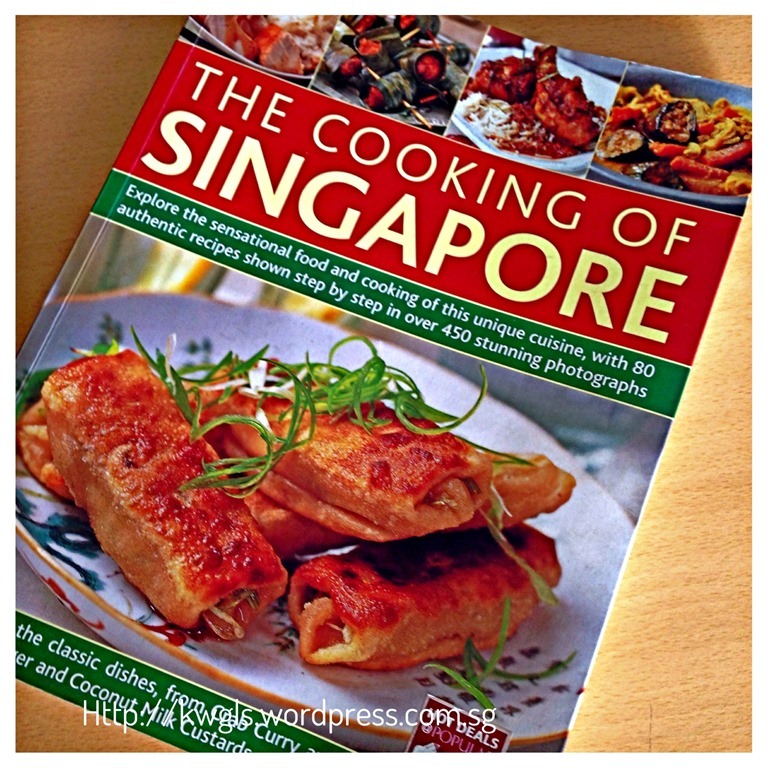 This recipe that I have obtained from “The Cooking Of Singapore” surprised me with their use of local spices or rather South Indian spices. When I am preparing this, I am a bit doubtful about the blending of taste between screw pine leaves and strong local spices like coriander and turmeric. However, after I cooked and took my first bite, I concurred that it is indeed a refreshing recipe and I should share with readers this recipe. I have to say, I love the slightly tangy lime aroma together with the coriander and turmeric flavours in the meat. To be fair with readers, as what I have described above, this dish has a lot flexibilities in terms of spices and seasonings used. 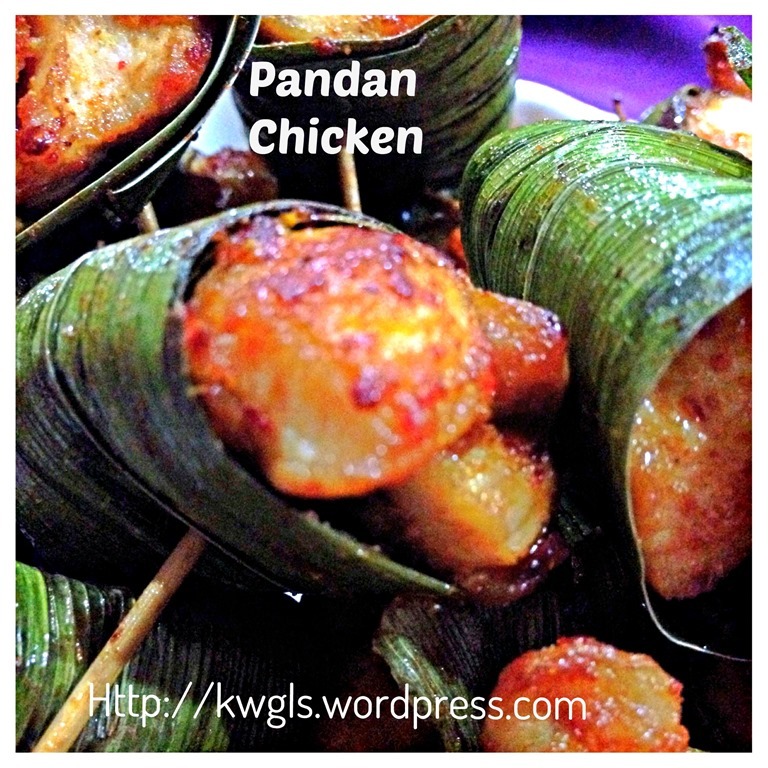 I am unsure and reluctant to conclude the “authentic taste” of Pandan chicken dish. As what really differentiates the taste mainly lies in the seasonings, I will encourage readers to use the types of seasonings, herbs and spices that are you are comfortable with for the marinating. 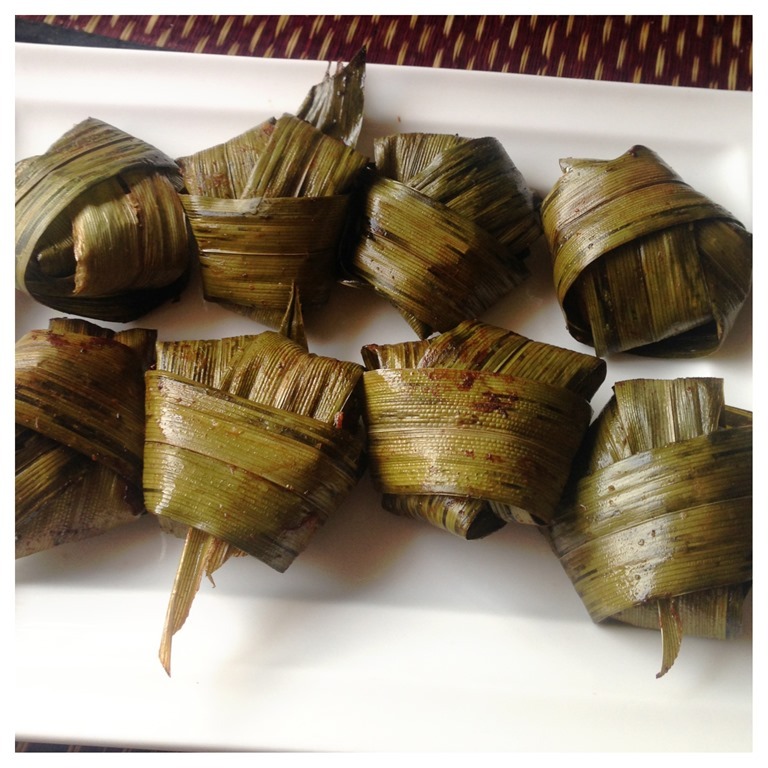 The main purpose of pandan leaves in this cuisine is help to protect the meat from direct frying and emitting a subtle pandan aroma. 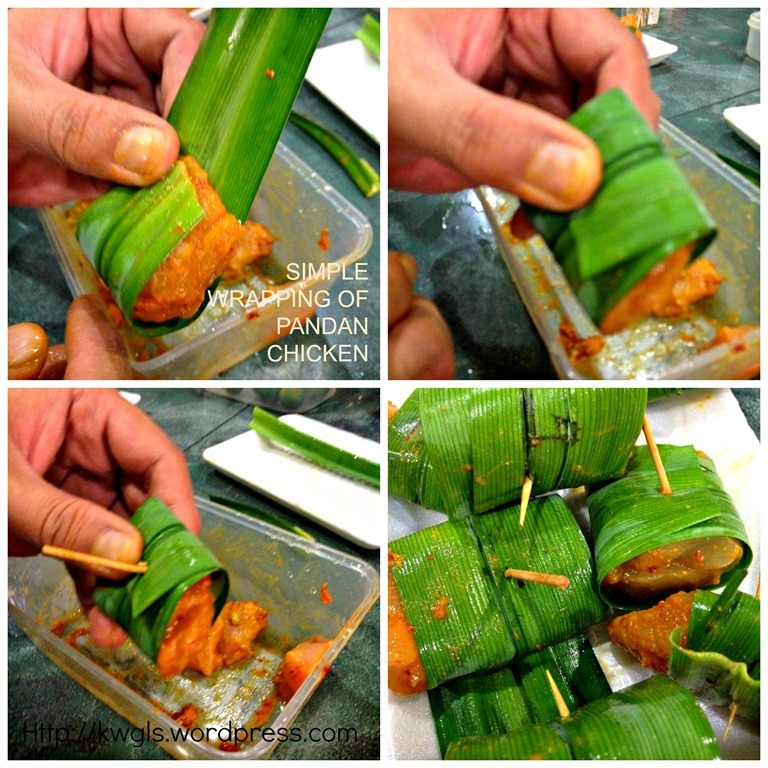 There are many ways of tying the pandan leaves but I am sharing the simpler way of using the tooth pick to fix the leaves and the toothpick can then be used to pick up the meats. 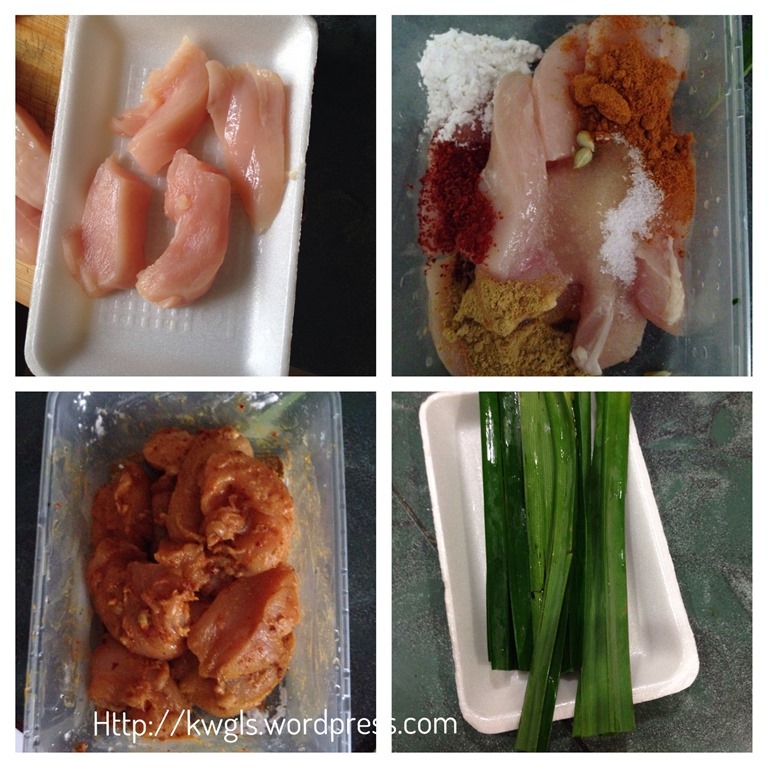 Cut your chicken into your desired size. Suggested size is 3 cm cube. 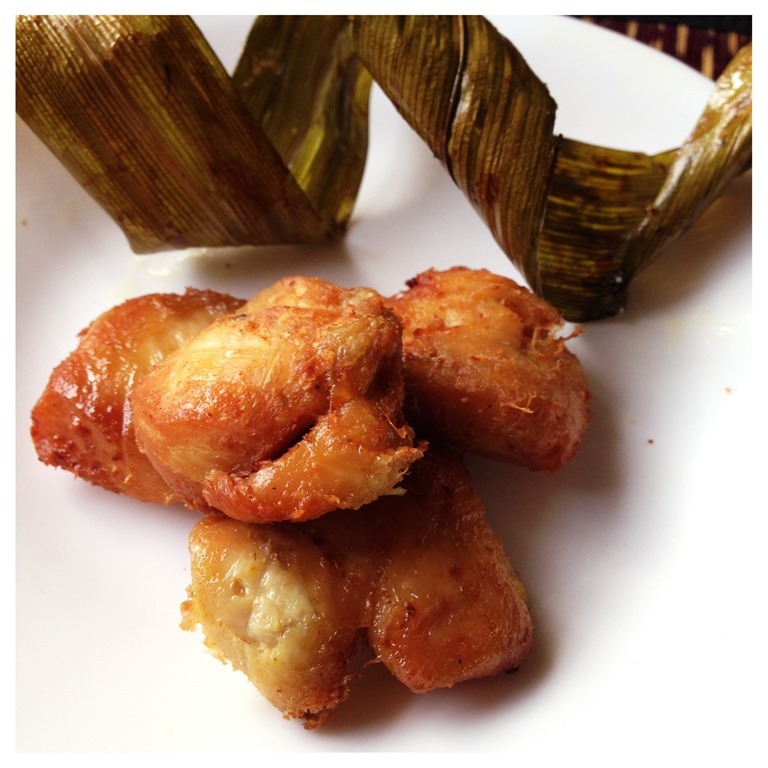 Marinate the chicken cubes with all the ingredients (corn flour, chilli powder, salt, sugar, coriander powder, turmeric or masala powder, calamansi juice) and let it marinate for at least 20-30 minutes. 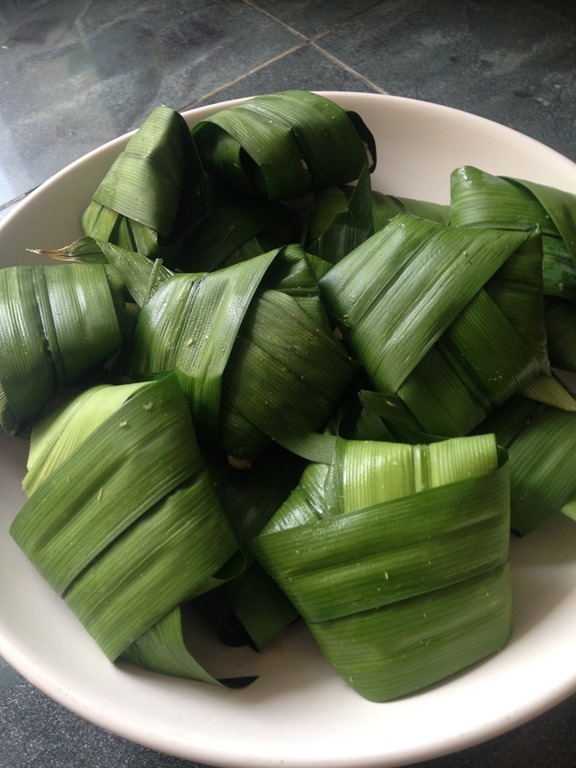 Meanwhile, wash the pandan leaves and cut into about 15 cm of length (if your pandan leaves are very short, just wrap it without cutting). 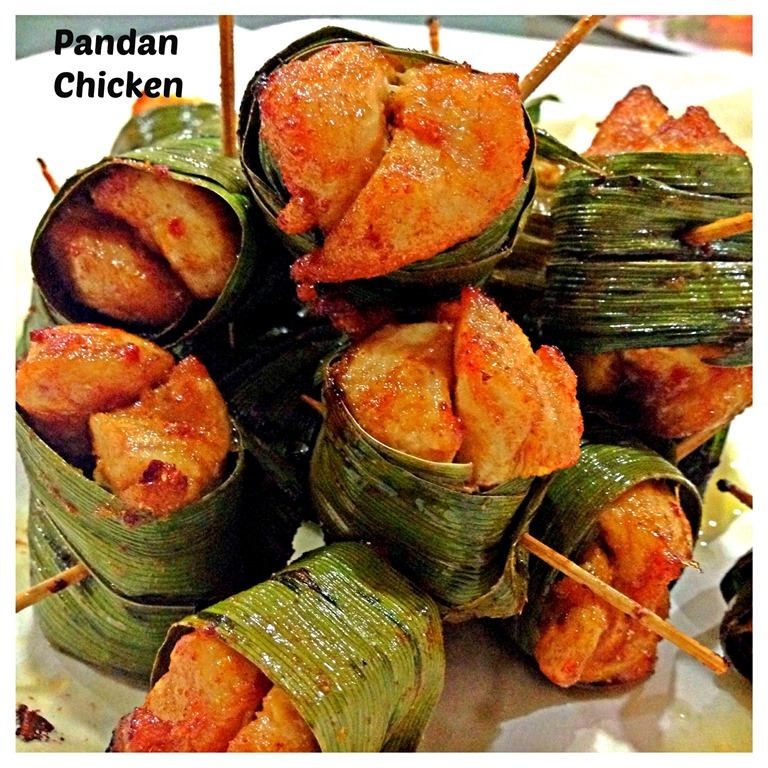 Take a piece of the chicken cube, use a pandan leave to wrap the chicken and secured by a toothpick. Cut away the ends if necessary. Heat the oil under high heat. The oil is considered as ready when a chopstick placed in the oil, bubbles start to come out. Turn the heat to medium heat until you drop all the chicken into the hot oil. 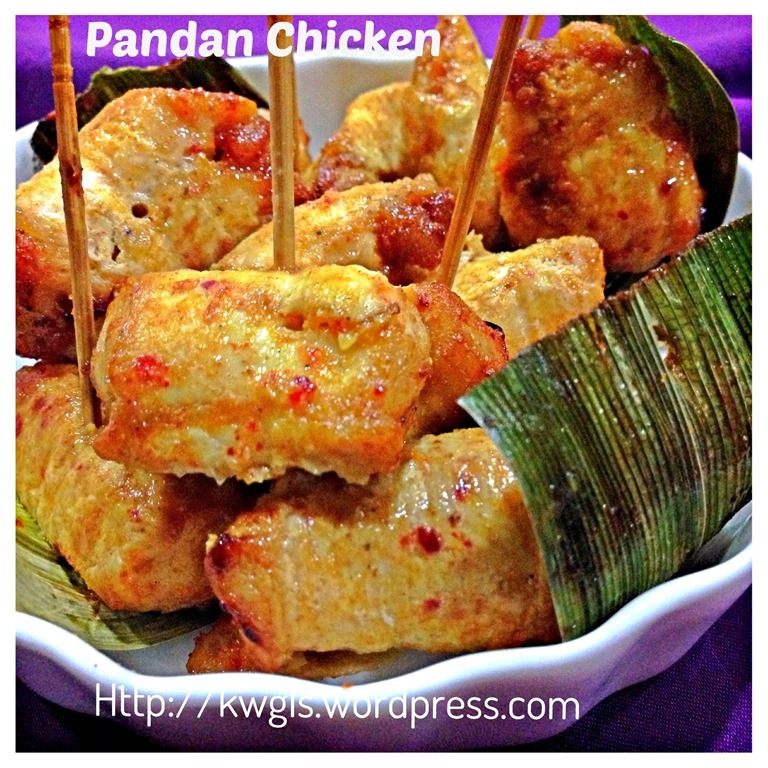 Deep fry the chicken for 10-15 minutes or until the chicken turns golden brown. Drain and put in a piece of oil absorbing paper before transferring to serving plate. Unfasten the leaves before serving and use the toothpick to poke the meat for easier serving. 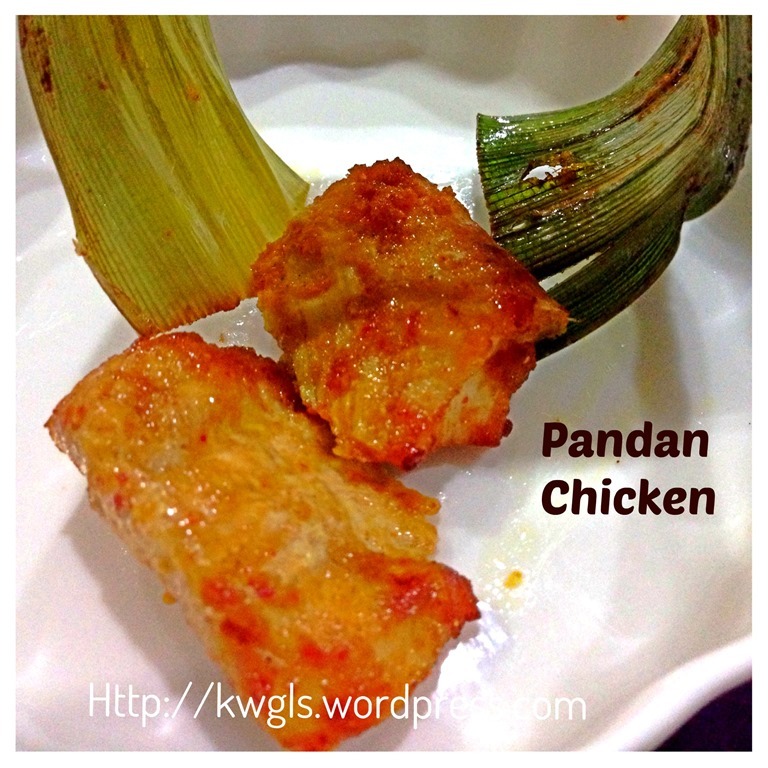 Best serve as a snack or side dish in a full course Chinese meal. 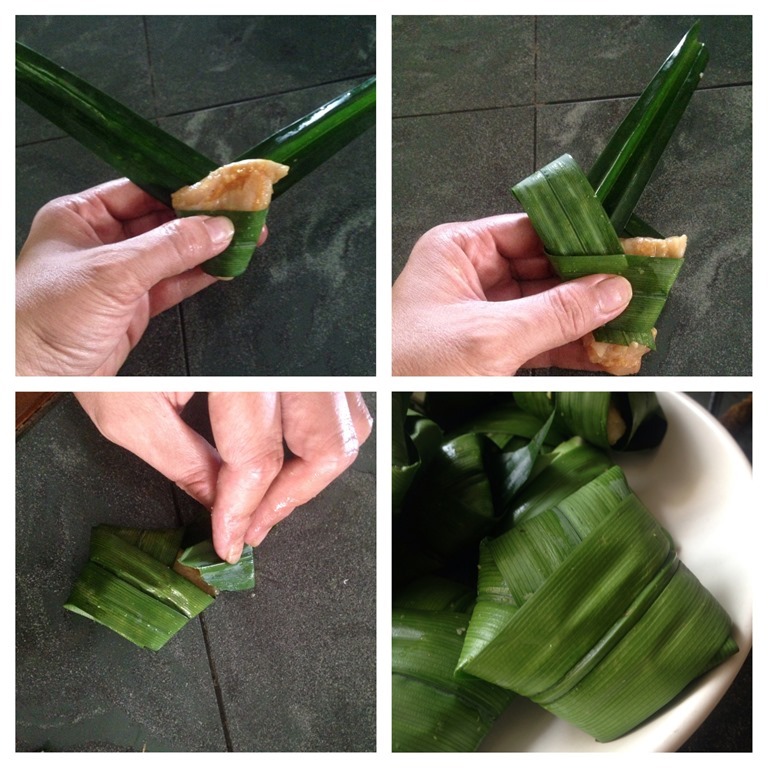 Take a piece of Pandan leaves and shape it like an X-letter. Put a piece of chicken meat on the centre cavity between the two ends. Fold one end towards the centre and coming out from the centre gap. Perform the same for another end. Fold the extra end back towards the centre. Many of my Facebook friends thought that this is a difficult dish to prepare. In fact, it is very easy. 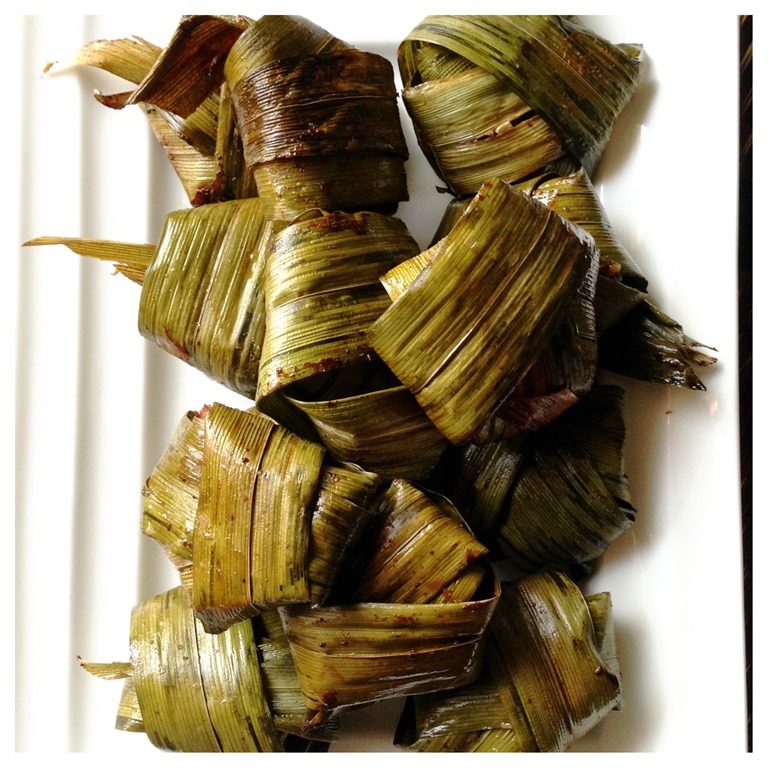 Remember that the Pandan aroma are rather subtle and therefore, you can always use your preferred spices and seasonings. In addition, if you have an air fryer which is very trendy nowadays, do make use of it to limit the daily fats intake. Though very simple common spices used, this is a very nice dish. I will recommend this dish as party snacks to impress your guest. However, for home consumption, if you can’t get hold of the screw pine leaves, just ignore and pan fry the chicken will give you an equally delicious meat dish. 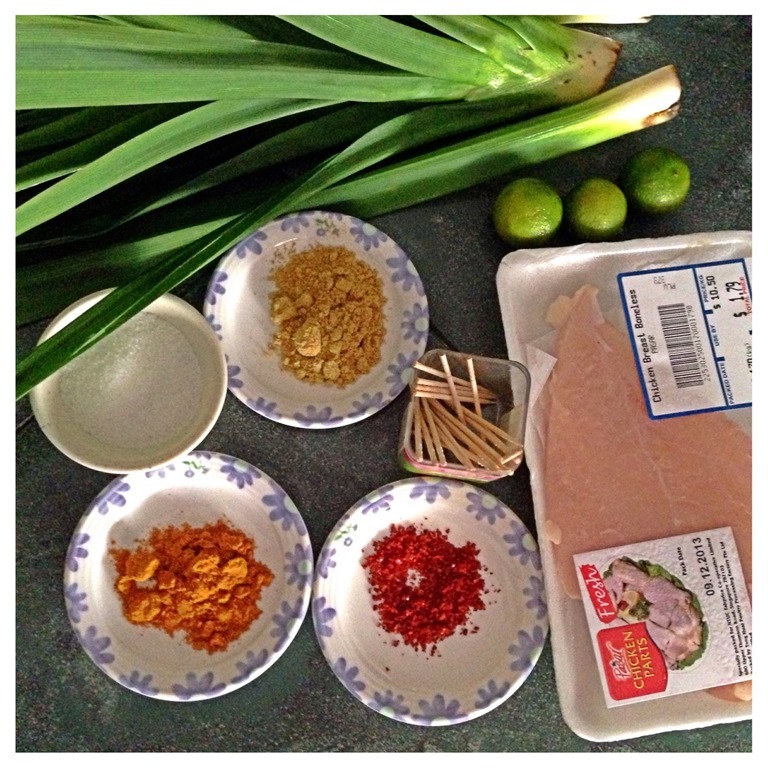 This entry was posted in Food Preparation Series, Meat Dishes and tagged 8, Ayam pandan, 香兰鸡，, GUAI SHU SHU, Guaishushu, kenneth goh, pandan chicken, postaday, Screwpine chicken. Bookmark the permalink. ← Black Sweet Vinegar Pig Trotter Made Easy.. This sounds absolutely delicious. I will definite have to try it. Sounds delicious! 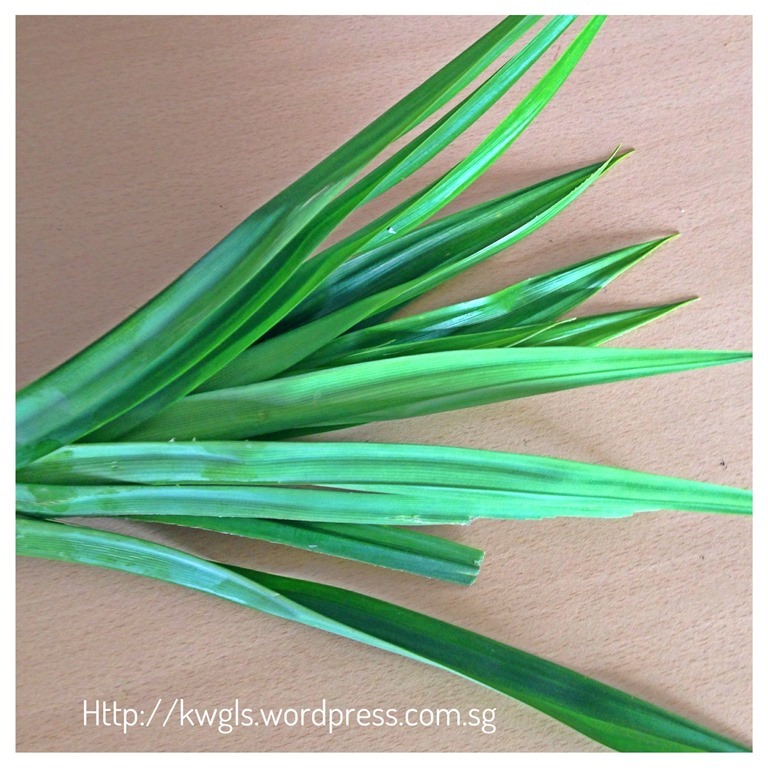 It can be difficult for me to be able to find pandanus leaves but I have seen it available once. I’d love to grow them- it would make things so much easier. 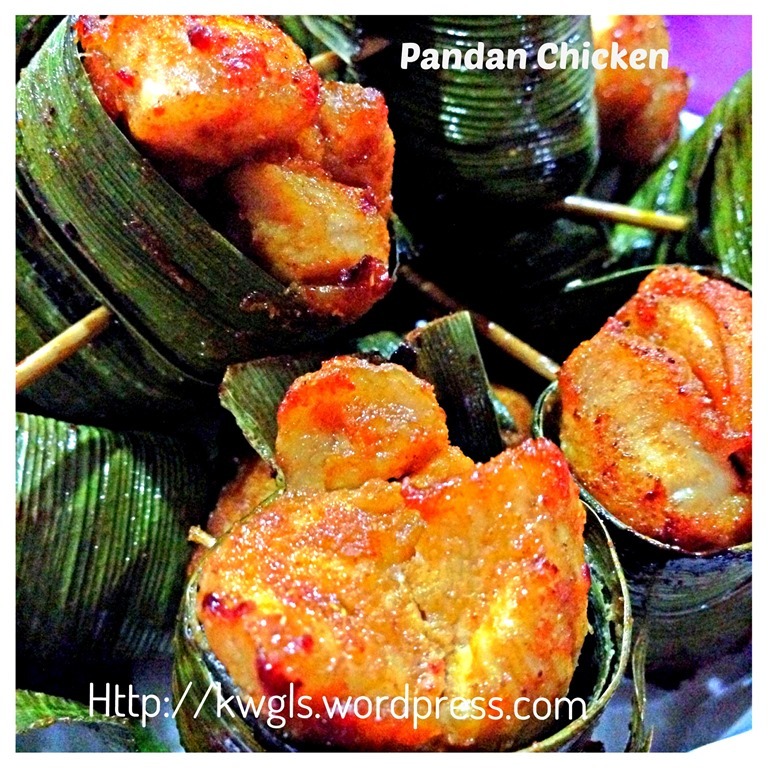 Gday LOVE pandan chicken! Yours looks YUM!